The 36th annual Weston-Super-Mare beach race took place this past weekend, once again witnessing the small coastal town in Somerset being taken over by the off-road racing community. A mass of 1200 riders competed in Sunday’s main event race, with a similar amount making up the Youth 125/250F, 65cc, 85cc and Quad / Sidecar classes. Not too mention all the vehicles, spectators, vendors and trade stands, it was a sight to behold and one made even more spectacular by the glorious weather, something we are not always so lucky with this time of year. 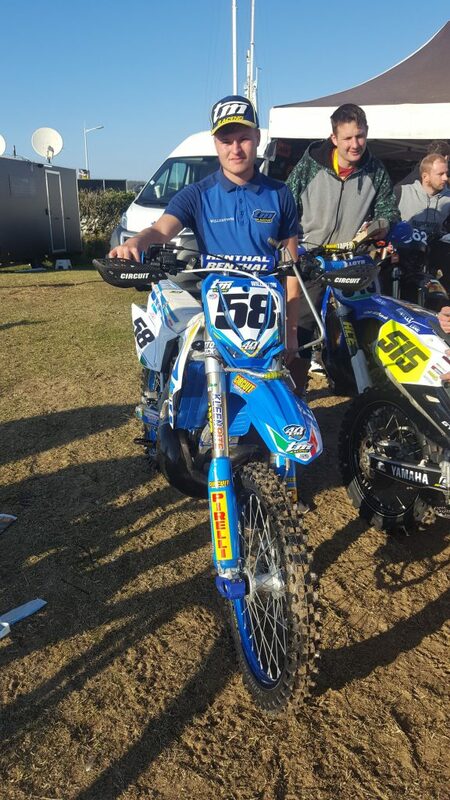 Riding under the TM UK banner this weekend was regular MX competitor, Troy Willerton, on his 300cc 2-stroke machine, World Enduro competitor, Josh Gotts, on an MX 450Fi machine and finally, Charlie Hucklebridge taking part in his first big event on his Small Wheel TM 85 MX machine. Troy, starting number 58 after last years achieved result, made a good start and sat around 20th place after the first lap. A ‘crash’ soon after saw Troy pit early for goggles and a ‘quick splash and dash’, with no major damage to the bike being observed, albeit for some ‘cosmetic’ marking, it was back to business. After losing some places due to the unscheduled stop, he began to settle into a good rhythm once again before stopping for his first ‘official’ fuel stop at approximately the ’60 minutes of racing’ mark. Out on the track and making ground once again we waited for the second fuel stop to be marked, however, sadly for Troy 15 minutes before his second stop we received news that Troy and his machine were stricken on the track and the bike would not re-start, it was game-over. After retrieving the machine from the sand and returning to the vehicles for a quick wash we started to determining the cause of the stoppage. The machine had no spark, sadly caused by damage to the kill switch wires in the early crash which had pulled the wires and forced them out of position between the radiator and chassis, now ‘pinched’ they eventually chaffed through, earthing out the spark circuit in the process. Once the kill switch was unplugged the bike fired straight back into life, a cruel end to Troy’s event with such a simple problem to remedy. Josh, who was ‘pre-seeded’, had a good position in the segregated start area which allowed the front runners to exit onto the beach ahead of the massive pack. As the race began Josh got off to a flying start and was inside the top ten within the first lap, running a great pace Josh maintained his top ten placing before his first scheduled fuel stop. Out on track and back on the gas once again, Josh was able to run a pace that saw him climb the leader board as the clock wound down, the 450 was definitely showing the power she can produce and the straight line speed was phenomenal. Now running in 6th place, with around an hour left to compete, it sadly came to an end for Josh as his rear mousse gave up, expanding inside the tyre and forcing the tyre clean off the wheel rim. A harsh ending that also occurred for many other riders sadly and a massive shame for Josh who was looking set for an incredible result. Young Charlie Hucklebridge took the the Weston Beach on his TM MX 85 Small Wheel machine in what could be described as his ‘first event’ on this new, larger capacity class bike. Only recently moving up from the 65cc class, Charlie has only had a relatively small amount of time on his new bike, with this in mind the aim was to learn, get comfortable and take it as it comes. After avoiding the start melee Charlie disappeared out of view on the straight and it was nearly 30 minutes before we saw him again. The large and hard to negotiate dunes, along with a lack of ‘assistance’ for the younger riders struggling to ‘dig-out’ their machines, saw Charlie and others competitors stuck in one place for nearly 20 minutes!. Charlie finally appeared and stopped immediately for fresh goggles and fuel, back out on track Charlie began to settle into a rhythm. Stopping again at around the 50 minute mark, Charlie once again settled into a good pace and after making a final stop for a drink and a little fuel top up in the last 10 minutes it was once last push to the flag. A very good ride for Charlie, a sensible, calculated, clean and tidy race that saw him end in an excellent 22nd position in his class. A big well done to all involved. Also, a big well done to all the TM riders at the event, with a good showing of models and model years from the TM Racing catalogue from modern back to the mid-nineties.